When it comes to building supercars, no one these days – with the possible exception of McLaren – does it better than Ferrari. The mid-engine 458 Italia, for example, which ceased production around three years ago, was as exquisite and intoxicating as a modern motor car could be and that, of course, made it an impossibly difficult act to follow. Yet Maranello not only did just that, but it came up with a replacement – the 488 – that turned out to be equally glorious: ridiculously fast, perfectly balanced, more striking to behold (if perhaps less architecturally pure), easier to drive and, if pushed sufficiently hard, absolutely capable of terrifying the living daylights out of driver and passenger. And we do like that in a Ferrari. The cavallino rampante’s touch, however, has been rather less assured when it comes to building contemporary GTs. A case in point is the California, a hardtop convertible two-plus-two that first appeared at the Paris auto salon almost 10 years ago, when it revived a near-legendary name from the late 1950s. Devised as an entry-level contender that would attract a new demographic to the brand, and pitched as a rival to Porsche Turbos and Merc SLs, this front-engine equine was certainly eye-catching in a curvaceously feminine sort of way, but with a relatively lazy 453bhp and 485Nm from its 4.3-litre V8, and the relaxed chassis and suspension settings more typical of a boulevardier, it was inevitably perceived by some as being, well, hardly ferocious enough for consideration as a proper Ferrari. The arrival in 2014 of the twin-turbo California T helped to shift opinion in the right direction, for with almost 100 ponies more and a hefty 755 Newton metres of twist from its new 3.9-litre engine, not to mention less weight, revised adaptive suspension and an F1-derived traction-control system, it was much more like the real thing. Its sharper styling, with a front end resembling that of the f12 (one recent grand tourer that Ferrari did get right), helped too, as did the later availability of a more sporting handling package, though the T’s over-generous rump served as a constant reminder of its predecessor. Nonetheless, it did what it was supposed to do, selling in greater quantities than any previous Fezza and drawing several thousand new customers to the fold. Four years on, and Ferrari has taken the hatchet to the Cali once again, preserving the fundamentals, but binning just about everything else – including the name – in the process. For its baseline GT has now been so comprehensively reworked, with entirely new structure and bodywork, that a new moniker was also deemed necessary, and for inspiration the company looked much closer to home, namely the ritzy Italian resort of Portofino. (To this sceptic, however, the handle resonates more as proletarian Ford – think Capri, Cortina or Torino – than patrician Ferrari). Although clearly recognisable as the California’s successor, with almost identical dimensions, a retractable roof and similar seating configuration, the Portofino has been so thoroughly restyled that what was once soft and bulbous has become razor-edged and aggressive, and with a distinct rearward lean that’s accentuated by the long bonnet. I get my first glimpse of it at a media briefing, when we’re told that the design brief was first to consider the car as a coupe rather than a convertible – and with the raked C-pillar of the raised top now beautifully integrated into the rear of the car like a proper fastback, it’s definitely job done. Indeed, this new design is beautifully proportioned and all of a piece in a way that the Cali’s never quite was. My test car, which doesn’t wear the new shade of Portofino Rosso but a more conservative metallic grey, looks sculpted, sinewed and sinuous, and is stunning from every angle, irrespective of whether the roof – which can now be raised or lowered in just 14 seconds at speeds of up to 40km/h – is up or down. The Portofino’s twin-blown V8 is one holdover from the older car, though naturally Ferrari couldn’t resist the temptation for further tweaking, with new pistons, con rods and a whole host of externals. Maximum power is now up to 600 metric horses, or 592bhp, with peak torque boosted marginally to 760 Nm, which is available from 3,000rpm in high gears. As with its predecessor, twist is computer-limited at lower ratios, encouraging you to exploit the full rev range of the V8 rather than short shift with the exemplary dual-clutch seven-speed. Nonetheless, there’s still a whopping mid-range punch here and as some 80kg has also been shaved from the California T, acceleration is more than just rapid. Officially, 100km/h comes up in 3.5 seconds, but I wouldn’t be surprised if it were quicker still; claimed maximum speed is now raised to “more than” 320 (or, for those who think in old money, about 200mph). 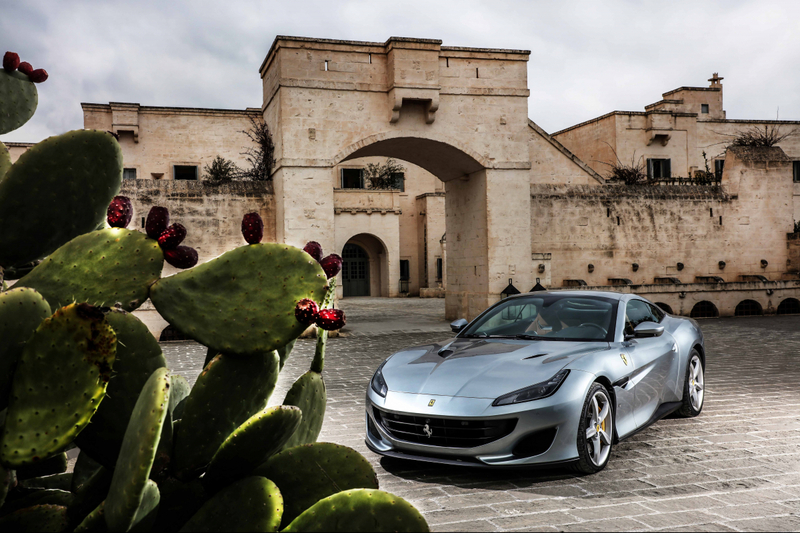 Touted as “the everyday Ferrari”, the Portofino is aimed at being civilised and versatile, as well as exhilarating. Thus, interior quality has been ramped up several notches, with super-comfy, 18-way-adjustable, slim-line front chairs built around aluminium frames, which help free up 5cm of legroom behind and make the occasional rear seats more fit for purpose. There’s new air conditioning and a proper 10.25-inch infotainment touchscreen now occupies the centre of the fascia. The leather-clad steering wheel is loaded with switchgear, there’s a secondary LCD display to entertain – or, just as likely, scare – the front passenger and it all looks pretty snazzy. I still think, though, that Mercedes could teach Maranello a thing or two about cockpit bling. Ultimately, of course, we judge all Ferraris by the way they drive and fortunately this latest GT marks a quantifiable improvement over its predecessor in almost every area. The engine has become even more impressive: eager to rev, and massively flexible and torquey, it makes the Portofino hugely accelerative and lightning fast, with the caveat that on wet surfaces even the most moderate pressure on the loud pedal can unsettle the rear end, though that’s easy enough to control. That the V8 sounds more tuneful than the older car’s – and especially so above 3,000rpm – offers all the more reason to boot the throttle and rip up towards the red line, though it’s equally happy dawdling in seventh gear, which is something I never thought I’d write about a Ferrari. The gearbox is superb, quick-witted and intuitive when driven in automatic yet whip-sharp in manual. When it comes to building superb powertrains, the Italians are clearly up there with the best. I’m also impressed by the cushioned ride quality. Although our test route takes us along the cratered roads of southern Italy (for which a “bumpy” damper setting is thoughtfully provided), there’s little trade-off in firmness or body flex, and that’s in spite of the often-appalling surfaces. The Portofino is also one of the first Ferraris to get electronic steering and this, too, works well, being quick, nicely weighted and precise, and offering plenty of feel. With its front-engine layout and extra length and weight, it inevitably lacks the finesse of a 488, but thanks to the active differential and clever stability controls, which are rarely over-intrusive – not to mention the assurance offered by carbon-ceramic brake rotors – it can be punted along at speeds bordering on the outrageous. Which, as I said, is why we love Ferraris. Indeed, as the Portofino is faster, more involving, comfortable and versatile – and way more handsome – than the California T it replaces, it’s hard to imagine quite how the company could have come up with a better introduction to the manifold pleasures of Ferrari ownership. Thrilling with the roof down, quiet and civilised with it up, it’s a car for all seasons that, with its V8 engine and classic looks, ticks almost every box on the desirability check list. The Portofino arrives in Asia next month. If you haven’t done so already, there’s still time to get in line.